The Reaper. See Pictures, Prices, and Descriptions. 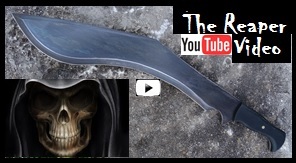 Made by Scorpion Swords & Knives. The blade is designed off the Ancient Greek Kopis. The forward-curving blade was historically designed for for lopping limbs and hacking off heads.